Inspired by a quilt that my friend Mary shared with me from Pinterest, I decided to design an Ombré HST quilt mathematically. This was the result. I chose to use a gradient of eight different values, numbered 1-8 from lightest to darkest. I began by drawing a 7 by 9 rectangle in my graph notebook and randomly adding diagonal lines in each square. 63 squares meant 126 triangles, so dividing that by 8 different values, there should be 15.75 triangles of each value. I used six of my values 16 times each, and two of them 15 times each, filling in the triangles somewhat randomly while using the lower numbers more frequently at the top of the quilt and the higher numbers more frequently at the bottom of the quilt. The last numbers I filled in were 4 and 5. Knowing that it would be easiest to make HSTs two at a time, I counted up my pairings and found that seventeen combinations were used an odd number of times (meaning that two at a time HSTs would not be very efficient). Seventeen was the perfect number of squares to add one extra row and one extra column to my design, so my design became 10 rows of 8 HSTs. My final adjustment was to make sure that I had used each value an equal number of times. Then I converted my numbers to the graphic above. This design can be made by choosing eight solids (or blenders or prints if you wish) in a variety of values. Tip: Use the black and white option on your camera phone to view the values of your fabrics; this way you can ensure contrast and verify that you have a range of values. Cut out ten squares of each of the eight fabrics. Choose your finished size of HSTs and cut the squares one inch larger. Create two at a time HSTs and trim to 1/2" larger than your finished size. Want a baby quilt? Use a fat quarter of each fabric*. Cut 5" squares and trim HSTs to 4 1/2" for a 32" x 40" finished quilt. Want a throw quilt? Use a half yard of each fabric. Cut 8" squares and trim HSTs to 7 1/2" for a 56" x 70" finished quilt. (Scroll to the bottom of this post for a calculator to make any size quilt.) Use the list below for cutting and piecing and the diagram that follows for block placement to create your version of my design. Or go random and use your design wall to audition the layout of your design. Have fun! UPDATE: Visit my Craftsy shop to purchase your PDF coloring page for planning your quilt! Label swatches of your fabrics #1-8, in order by value, lightest to darkest. Cut ten squares from each of your eight fabrics. Make the following 80 HSTs. Like it in grey? Try these Kona solids: (1) Silver, (2) Ash, (3) Iron, (4) Pewter, (5) Steel, (6) Coal, (7) Charcoal, (8) Black. Use the handy slider below to choose what size you'll cut your initial squares. Trim to the size indicated for a finished quilt in the indicated size. Cut 4" squares. Trim HSTs to 3.5" squares. Finished quilt will be 24.5" by 30.5”. Finished blocks will be 3" squares. My February 8th newsletter has four great palettes to use with this pattern. Posted in Quilting. Tags: baby quilt pattern, Ombré HST Quilt, quilt pattern, Sarah Goer Quilts, throw quilt pattern, tutorial on February 7, 2017 by sarah. What a great tutorial! I will definitely be using it and have already ordered my fabric. I plan to get my fabric cut in March and the quilt top sewn together in April. Thanks for all the work you put into writing this tutorial. Take care, Mary. Excellent! I'm thinking I might be able to make a mini version with fabric I have on hand. Thanks for sharing this! You did a lot of work and figuring! I admire your brain power! Love the design! Thank you, Christine! I'm glad you like it. I'd love to see a picture if you make one. Hi Joyce. You can use the handy slider at the bottom of the post (just above the "Get my newsletter!" button) to adjust the block size to show the finished quilt size you'd like. Thanks! This is amazing and I totally pinned it! Thanks for the tutorial. I always struggle with the "randomness" while trying to plan a quilt. Who knew algebra would come in handy LOL Don't think I've ever used it since school. Thank you, Anja. I think the design wall is wonderful for throwing blocks up to create a random design, but you can just end up tweaking a design forever. 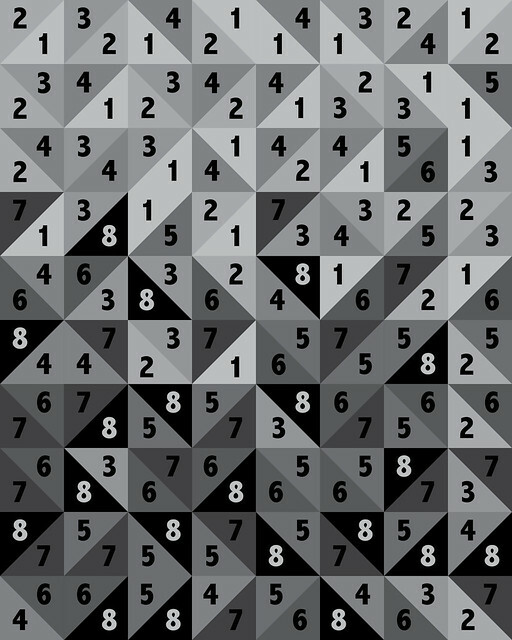 I think it would be fun to play with computer generated numbers for true randomness. Looking forward to seeing your ombre translated into color in your upcoming newsletter!!! Sarah, I'm so happy to meet you and welcome you to our guild. Your work is amazing and I will definitely use this tutorial in the future. Thanks for posting this! This is just what I have been looking for! Thank you so much. What size was your finished quilt? I would like to make a twin size quilt but wasn't quite sure of sizing compared to yours. Thanks again! Hi Emma. You're welcome! I included measurements for a baby or a throw. For a 68" x 85" twin you could cut 9 1/2" squares to begin with and trim your HSTs to 9" for 8 1/2" finished squares. Another option would be to go a bit bigger for more length and then leave off one column so it doesn't get too wide. (Maybe use those HSTs for a pillow, or on the back of the quilt). I'd love to see what you decide on. Please share pictures of your project! And let me know if you have more questions. Oh, this is perfect! I am going to try to see if I have enough blues in my stash for a batik baby quilt. I always feel like I tweak forever when just using the design wall. This pattern looks great and well balanced and pleasing to the eye. Thank you for sharing! Thank you, Kathy! I know what you mean. It's so easy to keep tweaking a design when it's on the design wall. I would love to see your quilt once it's finished. Please send me pictures! Thank you so much! I have been wanting to do an ombre quilt but was not sure where to start. I usually make up my own patterns but I will be following yours for sure. Thanks! Thank you, Sara. I'd love to see it when you make it. Please share pictures! Talk about icing on the cake, I love the slider tool you have included to customize how big to cut and trim squares for HSTs. Super handy!!! Thank you, Mary! Now I kind of want to make it in every size. I may make a tiny one. Now to decide on the colors! I don't know how I missed this when it first posted but I am glad you referred back to it in the newsletter. This is really cool. Pinning for my "I want to make someday" list! I'm glad you like it! Be sure to share pictures when you get around to making yours. Any idea what colors you'll use? ,how would you suggest I choose fabric , as in two values of each color, since there are eight ... will this give me enough change in the value for the effect ? I am passing this in to friends ... a great pattern and instructions ! Thank you so much Sarah ... I can't wait to try this ! Just ordered the 8 aqua colors to make a queen size quilt. What kind of quilting design did you use on the finished quilt? Any pictures of finished quilt? Thanks for the great ombré design! Thanks, Barb! Your quilt will be lovely. I'd love to see pictures! Please check out Mary's finished blue ombre quilt. As for quilting, I think there are so many options with this pattern. An all over motif would work well, and you could do something like Mary used or any favorite design. I think it would be fun with vertical matchstick quilting or crosshatch on the diagonal. Have fun! The aqua palette is so pretty! You are welcome! I'd love to see your projects as you complete them! Thank you so much! This is fantastic! You're welcome, Christine. I'd love to see what you make. Thank you Sarah for your wonderful, easy to follow quilt pattern. My Grandson and his fiancee have chosen your pattern to make a wedding quilt for them. I am so excited to do this pattern of yours and they are so excited to receive it. Thank you again. You are welcome! I'm honored that they've chosen my design. I hope you'll share photo with me when it's done. Thanks for the message, Dee! Do you have a picture of the back of your quilt? You mentioned using the extra fat quarters for the backing. I'm planning on making a twin size quilt in the grey tones you suggested. Do you have a color recommendation for the backing? I don't have a photo of the back. You could piece fat quarters to make rows and fill in with yardage to get to the right size for the backing. I think with the greyscale triangles on the front it would be real fun to have a pop of color on the back. Could be a print or a solid... so many options! I really like yellow and grey. Or teal and grey. Or even purple and grey. I'd love to see your quilt when you finish. Thank you, Jesse. Thank you, Linda. I'm so glad you enjoyed it! Beautiful! I am not able to use the slide option for queen size quilt. Can you please provide. Thank you! Cut 12" squares, trim HSTs to 11.5", quilt will finish at 88.5" x 110.5"
Cut 12.5" squares, trim HSTs to 12", quilt will finish at 92.5" x 115.5". I love this pattern and I want to use my Chalk and Charcoal fat quarter bundle. I need to make this into a king quilt. 1. Can you offer any suggestions that will help me, if I use smaller squares and just add more squares, where would I add them, which side, which placement? 2. Is there any way to make this using existing fat quarters with little waste? 3. Can I just adjust the width and length? 4. Do I need more fat quarters? A fat quarter could trim to 18"x18" or four 9"x9"
Any and all suggestions would help, please email me. The slider at the bottom of the post should help you determine what size squares to size this up to king size. You would need 80 squares to make my pattern as is. If you wanted to optimize for using fat quarters, cutting 9" x 9" or 18" x 18" makes sense, but you'll have to calculate how many blocks you need... you would need more than 80 9" x 9" squares for a king, or fewer than 80 18" x 18". You can of course alter the number of rows and the number of HSTs per row to suit your needs. Have fun! Thank you so much for making your ombré quilt design available. I think it is fantastic and I have been itching to make it for a while. The finished quilt will accompany my daughter to university this autumn. I’m using the Matchi range from Moda for a different look, with a dark border and perhaps a pieced edge using the off-cuts. Thanks again for the inspiration. Thank you so much, Harriet! I hope she loves it. Harriet - I’m also making one for my daughter for her first year of college. I’m interested in what size you’re doing. I was contemplating a finished square of 7.5 without a border or a finished square of 5.5 with a border. Please share-can’t wait to see the finished product. This is only my second quilt so it’s all still very new. I love Sarah’s Ombré design-perfect for a college girl. I found your pattern recently and decided it would be perfect for the monochromatic challenge our quilt guild had. The reveal was at our meeting last night. I hand dyed shades of coral, which happens to be the Pantone color of the year for 2019. It is also not a color I've used before, so I wanted to step outside the box. I am pleased with how it came out, although I had a few technical issues. I also had no idea how to quilt this! How did you quilt yours? Thanks again for sharing a great pattern, and also for including the size calculator. Our challenge had a size limitation so I made the initial blocks 3.5 " and trimmed to 3". Thank you so much for sharing about your project, Kristin! I'd love to see it. The only one I've done I did a simple meander to quilt it. I think straight lines echoing the vertical and horizontal seams would work well. Or a more dense all over FMQ motif in a thread that blends with the light fabrics. I really like your pattern, but what is a value and an HST ???? Thank you, Joyce. HST is half square triangle... a square made up of two triangles sewn on the diagonal. Value is in reference to how light or dark the color/fabric is.